I love candles and how their aroma fills a house. Apricot, mango, peach and vanilla are among my favorites. This morning I enjoyed the best home fragrance, better than any candle aromas. Baked apricot cobbler. Delicious! Apricots bring back fond memories of visiting my paternal grandmother (we called her Momo – sounds like Mom – O or Mom – Aw). Momo liked apricots. She had an apricot tree and liked to make one of her specialty cakes with apricot baby food. The apricot cake was moist and tasted scrumptious. The scent of this morning’s cobbler filled the house and made me think of the apricot cake. The cobbler is made with fresh apricots that I helped pick from a neighbor’s tree, another reminder of going to Momo’s. My job was to pick the fruit from the trees, gather vegetables from the garden, and hang the wet clothes from the washer onto the clothes line. It was work but fun. Eating the fruit from the apricot, plum, peach and pomegranate trees was my reward. You know this cobbler must be good if it’s baked in summer’s 90-plus degree weather. I usually save my baking for fall, winter, and holidays. Summertime is the time for grilling and chilled desserts. This coconut-flavored cobbler, though, is worth putting up with a hot oven for a short time. It really tastes good with one or two spoonfuls of ice cream. Maybe it’s the summer heat giving me apricot cravings. What gives me that idea is that lately orange cream sodas (and I hardly ever drink sodas), vanilla orange ice cream, and anything orangy-mango-apricot sounds and tastes SO good. No wonder Apricot Cobbler hit the spot. 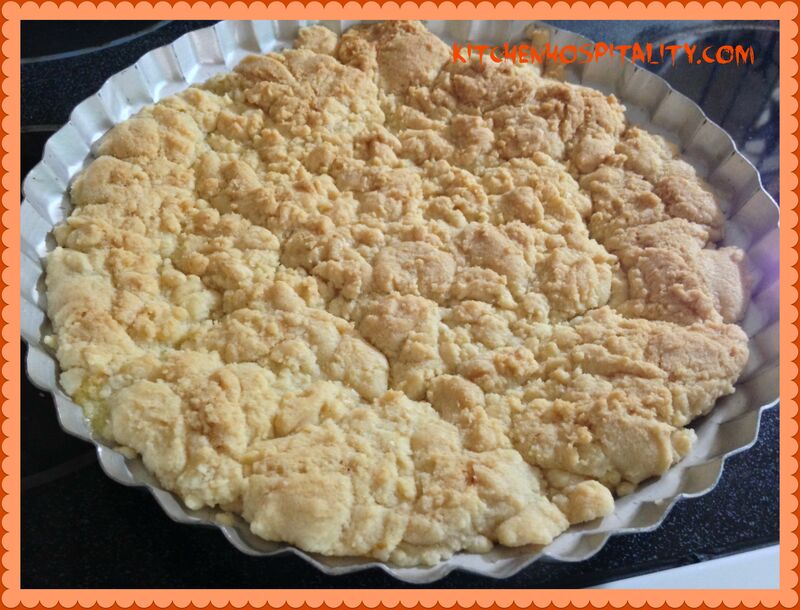 Grease a 9-inch fluted round pie pan. Wash and slice the apricots, placing them with the skin side down into the pan. Mix all other ingredients until crumbly. Cover the top of apricots with the crumbly mixture. Bake at 320 degrees for 45 minutes. Delicious served alone or with vanilla orange ice cream. Thank you for visiting my blog today. While you’re here, please take a moment to leave your comment. I love to hear from my readers. I’m going over to Miz Helens Country Cottage for today’s Full Plate Thursday blog linking party. I’ve already glanced at some of the foodie photos that I can’t wait to check out. That looks delicious. I don’t have apricots but I have a peach tree. I will try your recipe with peaches. So, true, Dee! How can we go throughout the summer without at baking occasionally?! 🙂 Thank you for commenting. You are so lucky to have access to fresh apricots instead of having to take your chances at the market. I love you pan. Yes, it was a treat to get the fresh apricots. I didn’t even know my neighbor had an apricot tree before. I love to bake in that pan. I found it at an estate sale of a lady who loved to cook.